Austin DeCoster, owner of Wright County Egg, addresses the House Energy and Commerce subcommittee on investigations. Watch the hearing live . Need a refresher on the egg recall situation? Here are the basics of what happened. And here's a roundup of egg safety coverage from Eatocracy. Washington (CNN) -- The owner of one farm at the center of a massive egg recall apologized to anyone who may have been sickened by his product Wednesday, while another refused to answer questions about conditions at his operation. Orland Bethel, president of Hillandale Farms of Iowa, invoked his Fifth Amendment right against self-incrimination when asked whether he knew about unsanitary conditions at one of his farms before an August e-mail from a production manager. 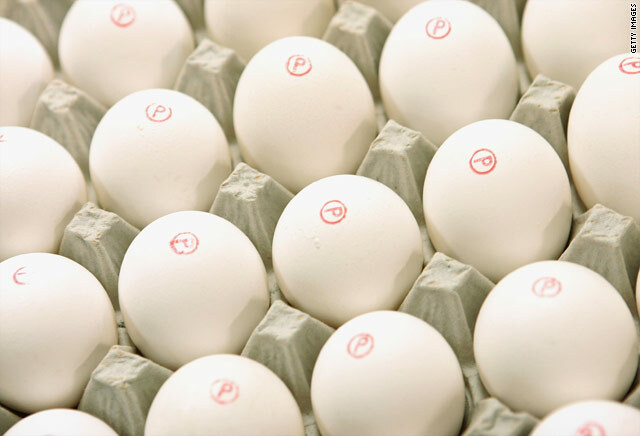 Bethel was appearing before a House subcommittee investigating the outbreak of Salmonella enteritidis that sickened more than 1,600 people and triggered the recall of more than half a billion eggs. Duane Mangskau, Hillandale Farms production representative, told the committee that the recall has forced his firm "to take a hard look at our operations." "And even if the source of the salmonella illness is never confirmed, where we have fallen short in Iowa, we are committed to improving our operations," Mangskau said. He said Hillandale has cut its marketing relationship with another DeCoster-owned farm "because we were disappointed with the test results there." Meanwhile, the owner of the other agribusiness firm involved in the recall said he was "horrified" that eggs from his company may have sickened anyone. "We apologize to everyone who may have been sickened by eating our eggs. I pray several times each day for all of them and for their improved health," Austin "Jack" DeCoster, the owner of Wright County Egg, told the House Energy and Commerce subcommittee. DeCoster -- whose chicken and hog farms have been repeatedly cited by state regulators in the Northeast and Midwest -- said his company's compliance with food safety regulation suffered as it grew, and "I am sorry for those failings." "I accept responsibility for those mistakes in our operations," he told the committee. 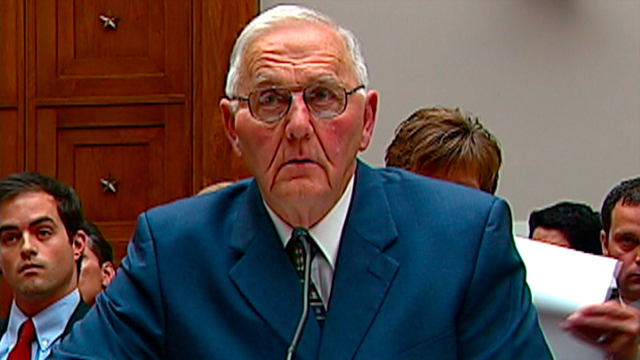 And DeCoster's son Peter, Wright County Egg's chief operating officer, told the subcommittee that "while we always believed we were doing the right thing, it is now very clear that we must do more." But the DeCosters faced sharp questions throughout the hearing from lawmakers, including the chairman of the full committee, Rep. Henry Waxman. Salmonella occurs naturally in chickens, but Food and Drug Administration inspectors reported in August that neither Wright County nor Hillandale fully followed their plans to prevent Salmonella enteritidis, the strain behind the outbreak. Federal investigators reported finding salmonella bacteria in chicken feed and in barn and walkway areas at the farms, as well as rodents, heaping piles of manure, dead animals and uncaged birds and flies too numerous to count. "It's hard for me to reconcile your words, that you wanted to clean up and you did clean up the facility, with the record before the committee," said Waxman, D-California. "The conditions in your facility were not clean. They were not sanitary. They were filthy." But the committee's ranking Republican, Texas Rep. Michael Burgess, also questioned why Department of Agriculture inspectors failed to report conditions at Wright County Egg to the FDA. "If you know this is a high-risk food and a high-risk practice -- and the deCosters kind of have a history -- why wouldn't someone say something?" Burgess asked Dr. Joshua Sharfstein, the FDA's principal deputy commissioner. Burgess suggested the outbreak could have been averted "if one federal agency had used common sense and talked to another feeral agency. " Sharfstein said the FDA and the USDA, which regulate different aspects of the industry, "are working on improving communication." But he said new regulations on egg producers and a food-safety bill pending in the Senate "would allow us to make those inspections as effective as possible." At the outset of the hearing, Waxman said the DeCoster family has had "warning after warning" about conditions at its operations for decades. Despite those warnings, DeCoster family companies "continue to raise chickens in slovenly conditions and make millions of dollars by selling contaminated eggs," he said. And DeCoster's remarks were briefly interrupted by a protester the Farm Animal Rights Movement, a group critical of industrialized agriculture. The man carried a banner that proclaimed, "Recall ALL egg production." "DeCoster and his cohorts are a mere piece of a larger picture," the man said before being escorted from the hearing room. There were fireworks among members of the committee as well, as its ranking Republican tried to rebut Democrats' criticism of Oklahoma Republican Sen. Tom Coburn, who is fighting new food safety legislation supporters say could have prevented the outbreak. At one point, subcommittee Chairman Bart Stupak, D-Michigan, cut off Burgess's microphone when he tried to read a statement blaming the Senate's Democratic leadership for stalling the bill. Burgess later accused Stupak of "censorship." Stupak said Burgess -- who supported the legislation -- tried to "back-door" a statement from Oklahoma Sen. Tom Coburn into the record after his time had expired and without the consent of the committee. One of those sickened in this summer's outbreak was Sarah Lewis, who told the subcommittee she ended up in an intensive-care unit after eating a custard tart at a party for her sister's college graduation. Her sister also fell ill.
She said she still suffers from severe abdominal cramps, diarrhea and fevers and has to take between five to 10 drugs a day. "I lost 30 pounds," she said. "My sick joke is, 'You can cure my salmonella in 30 more pounds,' you know what I mean? But it's not funny."